The implementation of Universal Health Care (UHC) in the Philippines is driving the demand for improved healthcare services. The increased government spending towards UHC has led to local and regional business groups in the Philippines to increasingly expand their investment in the industry. Shivanthika Murugan – Associate Project Manager at EMeRG analyzes the key investments in the healthcare sector and investment opportunities in the private healthcare sector. Currently, the country has 1,800 hospitals (public and private) with a total bed capacity of 77,000. However, by 2018-19, the archipelago is likely to have an additional requirement of 100 hospitals with 100,000 beds to cope with the healthcare needs of the growing population as identified by the Private Hospitals Association of the Philippines (PHAP). Corroborating this is the active growth in mergers, alliances and acquisitions witnessed in the country’s healthcare space for the past two years. Particularly in the first six months of 2017, the Philippines welcomed a slew of investments into its healthcare sector. Investments Infrastructure holding firm MPIC is currently considered to be the largest healthcare group in the country. The firm is targeting a bed capacity of 3,000 by scaling up its network of hospitals from its current 14 hospitals to 25-30 hospitals over the next decade. Vista Land & Lifescapes – one of the country’s largest homebuilders is looking to provide world-class and affordable health services to its residents within Vista Land Communities and nearby areas through Vitacare Health Group. Currently with two hospitals under construction, the firm is targeting 10 more hospitals with a total of 3,000 beds within five years with an investment of at least P8 Bn ($0.15 Bn). Apart from these infrastructure firms, Allied Care Experts Group (ACE) is another market participant catering to the Filipinos’ healthcare needs. Founded in 2002 by a physician, ACE operates hospitals owned and run by medical professionals. The group currently operates 8 medical centres across the country apart from Manila and is likely to add 16 more centres to its operation in coming years. In addition to hospitals, the private market participants are also actively seeking to expand healthcare services to tier II/III cities and suburbs of tier I cities through primary clinics. Ayala has launched affordable and accessible clinics known as FamilyDoc for the middle-class communities. Each branch offers clinical services, diagnostic facilities (with laboratory and imaging), and pharmacy. Currently the group is operating 6 clinics in the outskirts of Manila. However, Ayala plans to operate 100 FamilyDoc clinics by 2020. The zeal harboured by Ayala towards clinics is a reflection of its focus on the hub and spoke model. Ayala is planning to integrate large facilities (500 bed) with a network of small clinics which it sees as fitting as compared to operating several individual hospitals. The patients diagnosed in these clinics are to be transferred to the large hospitals if hospitalization or surgery is needed. Cumulatively, the private investment from these major infrastructure giants is expected to be roughly around ~P15-20 Bn ($0.29-0.39 Bn) before the end of the next decade. This investment is likely to infuse approximately 10,000 beds for its citizens seeking private healthcare. The current investment pattern is expected to stimulate the demand for high-end capital equipment such as MRI and CT and diagnostic units such as Ultrasound and Radiography. The 100+ clinics which are expected to be operational by 2025 in the country are also likely to require low cost radiography equipment and other value segment devices. A significant stakeholder in the healthcare segment – pharmacies are also attracting private investments from market participants intending to dominate the entire value chain. In 2016, Robinsons Retail Holdings of the Gokongwei Group (a prominent conglomerate in the country) purchased 51% of The Generics Pharmacy (TGP). Currently, the pharmacy chain operates 2,017 branches all over the country. In 2015, Ayala acquired 50% of Generika – TGP’s nearest competitor. Generika has 670 stores nationwide which is expected to inflate to 1,000 by 2020 with Ayala having already allocated P200 Mn ($3.9 Mn) to widen the presence of Generika in the country. 1.Increasing healthcare presence in tier II/III cities: With majority of private facilities concentrated in Manila, the recent investments highlights the dissipation of funds into facilities in tier II/III cities such as Zambonga and Bacolod. 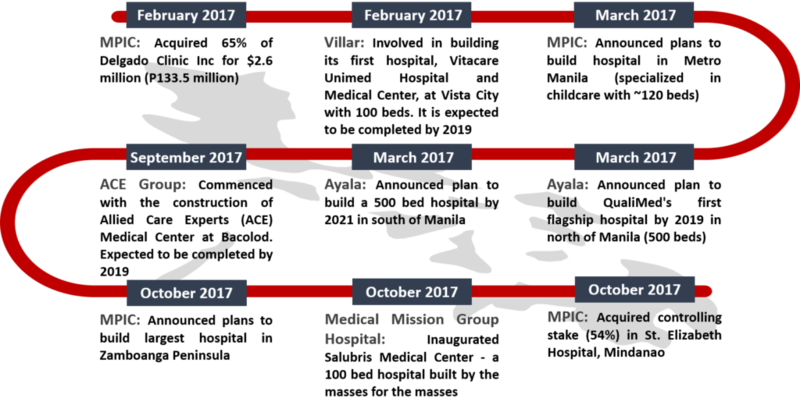 2.Greenfield/Brownfield projects: The theme for investment by the private players is primarily divided between greenfield and brownfield projects; MPIC is actively looking to acquire hospitals/clinics and infuse capital to upgrade infrastructure, whereas Ayala and Villar are keen on constructing hospitals/clinics. Villar in particular wishes to handover the operation of its hospitals to a consortium of doctors. 3.Customer focus: In order to tap into the healthcare demand from the rapidly expanding middle class in the country, Ayala is currently offering medical services 30-40% cheaper than rivals. On the other hand, MPIC and Villar are perceived to pander to the affluent class. The expansion in pharmacy chains offers an established and regulated network to pharmaceutical giants trading in insulin drug delivery and other related devices. Growth in pharmacy chains also provides abundant opportunities for market participants dealing in home care devices and cosmeceutical carrier devices. 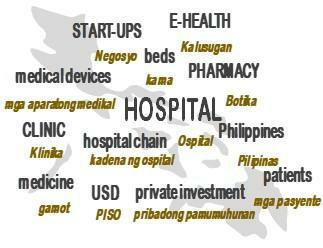 Filipino med-tech start-ups providing ancillary healthcare services are also attracting investments. These indigenous start-ups are attempting to create innovative business models to address the needs for telemedicine, e-health, data analytics and e-commerce in order to improve the care provided. With a patented radiology software platform, LifeTrack Medical Systems, connects hospital residents with experienced radiologists. In 2015, LifeTrack raised an undisclosed amount in seed funding from local investment firm Kickstart Ventures Inc and other strategic investors. KonsultaMD offers anytime access to doctor consultations at minimal per-minute charges. The services’ membership grew ten times between 2015 and 2016. In 2017, they partnered with home care app AIDE to provide people the convenience of acquiring medical care within their home. mClinica analyses the information collected from pharmacies to generate actionable insights. In 2017, mClinica received Series A funding from a wide mix of institutional investors (Unitus Impact and Global Innovation Fund) worth $6.3 million. Wellbridge Health Incorporated owns a FDA-licensed ePharmacy and medicine benefits management service known as MedGrocer. The service enables customers to receive medicines after ordering it online. In 2017, Ayala ventured into the health tech space with an investment in Wellbridge Health. 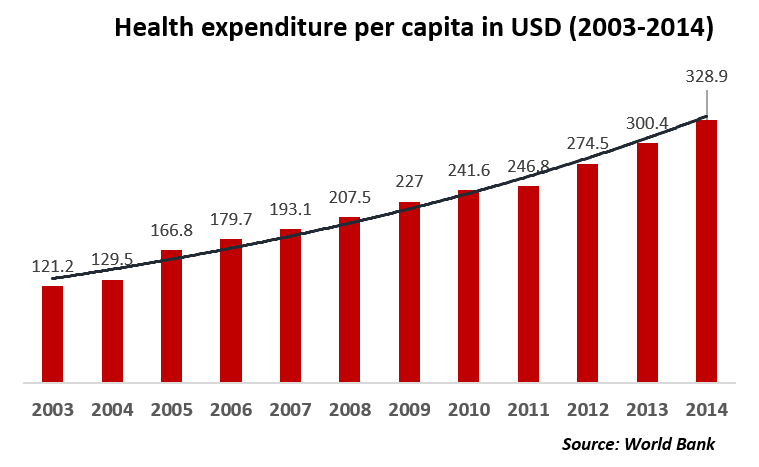 An aging population (9% of the population above the age of 60 years) and rapid urbanisation (45% of Filipinos living in urban areas) has certainly led to an increasing demand for healthcare services. Further strengthening these two factors is the rising spending power of the middle-class Filipinos. Foreign patients are a major revenue generator for private hospitals; their share represents 10-15% of private hospitals’ revenue in the Philippines. Private hospitals in the region vie for a share of this pie and in turn regularly upgrade existing facilities and increase capacity to meet international standards for their foreign patients. Being a part of the AEC, the country has had improved access to free flow of goods, services, capital and skilled labour in the regional healthcare sector since 2015. Private hospitals, pharmaceutical producers, and healthcare IT companies are expanding into the Philippines market, partially owing to the recently formed AEC. The country’s public and private healthcare efforts have been acknowledged by international agencies as well. In a recent study – “Private Sector Global Health Care R&D project,” by the Brookings Institution, Philippines ranked eighth among 18 low and middle-income countries in Asia and Africa based on four parameters – leadership and management capacity, infrastructure and financing, policies, regulations and health systems. As highlighted above, the Philippines’ private sector presents opportunities galore for medical OEMs. The robust growth in the number of private hospitals and clinics along with the country’s initiatives to provide Universal Healthcare to all its citizens has further cemented the collaboration between the public and private facilities to provide quality and accessible healthcare to all Filipinos. The country’s zeal in providing quality healthcare governance is setting the pace towards creating a congenial atmosphere to invite potential foreign investments.